Innovation in designs of kitchen sinks have pushed our sales to break the global barriers & penetrate in international market. Press Fab Industries is a well acclaimed manufacturer and exporter of finest quality stainless steel kitchen sinks and under mount kitchen sinks for domestic as well as international market. Incorporated in 1996, Press Fab Industries is an accredited supplier, manufacturer and exporter of high quality stainless steel kitchen sinks, stainless steel undermount sinks, kitchen undermount sink, etc. 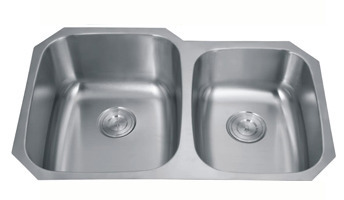 as well as steel sinks that can be used for other domestic or industrial applications. Our decade of experience and expertise has aided us to modify and improvise the sink into a malleable center that is an epitome of functionality and practicality. We present a myriad of kitchen sinks, stainless steel undermount sinks, kitchen undermount sink, etc. in a voluminous possible choice of sizes, shapes and designs to our esteemed customers across globe. With a wide range of our products, we have redefined the complete look of the place by providing it an aesthetic allure and proficient utility at the same time. Our Trustworthy Brands Press Fab Industries market it's wide assortment of products under three brand name SILVERLINE. Our series of stainless steel sinks under PREMIUM SERIES & SIGNATURE SERIES are an apt culmination of style, sophistication and have long lasting sheen. On the other hand, MODEX SERIES encompasses products that cater to all the stratum of society, are facile to use and virtually requires no maintenance.